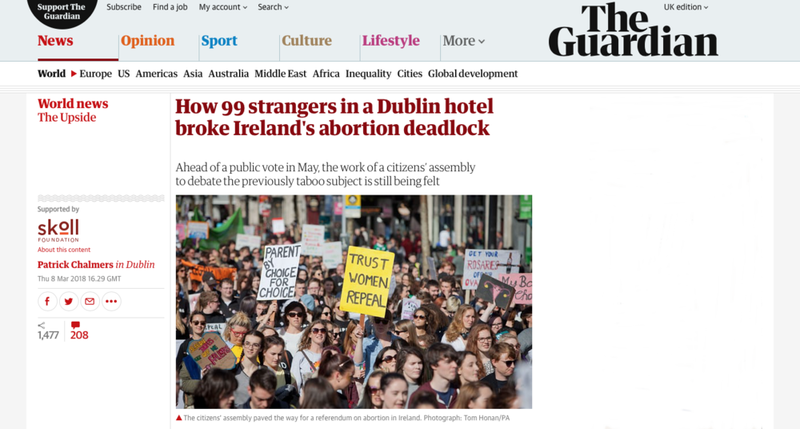 Ireland's Citizens' Assembly, which is the subject of the All Hands On pilot film - When Citizens Assemble - is also the subject of an article by Patrick in The Guardian. The Citizens' Assembly is chosen by lot and is an excellent example of participative, deliberative democracy in action. Patrick's piece tells the story of how a randomly selected, representative sample of 99 citizens has brought about a national referendum. The article is "part of a series on possible solutions to some of the world’s most stubborn problems". This could hardly be more apposite to our project. The Citizens' Assembly has allowed Ireland to make progress on the abortion issue after 34 years of deadlock, during which conventional politics has failed to make progress. Several commentators have suggested that, for this reason alone, randomly selected citizen juries can act as a useful bolt-on to conventional government to address challenging political issues.